I've been feeling guilty: I signed up for the Butterfly Knitalong and have barely knit a stitch of Butterfly since doing so. I mean, it sort of defeats the purpose of a knitalong if you're not knitting, doesn't it? In an effort to put my guilt aside, I picked up Butterfly again this long weekend. It took me a while to re-learn the lace pattern (yes, it really has been that long), but once I re-mastered it things moved along reasonably quickly; I'm almost done with the decreasing. I'm really glad I picked this up again. 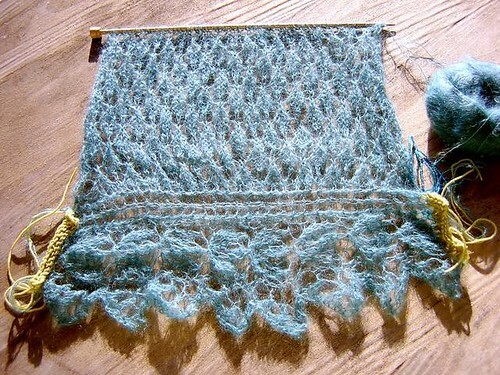 I haven't knit much lace recently, and hadn't realized that I'd been missing it. I'd also forgotten just how pretty this piece of knitting is. I'm using relatively small beads (not sure if this is a mistake), so their effect is subtle, but I love how they make the fabric sparkle. Cross-posted on What Katie Did.